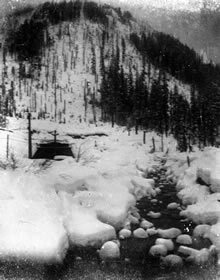 The east portal of Cascade tunnel is flanked by a creek. At this station, trains added or removed electric locomotive "helpers." 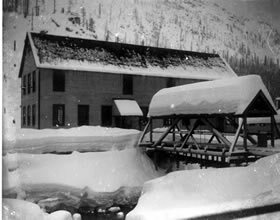 At Cascade Tunnel Station, a small facilty to house and feed workers was rebuilt after the original structure was destroyed in an avalanche in February 1910. 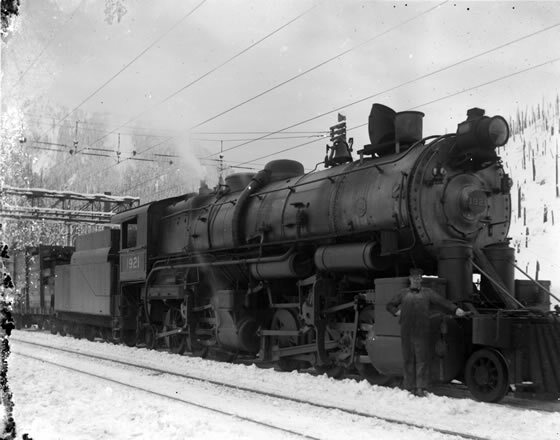 A train pulled by mallet locomotive 1921 arrives at Cascade Tunnel Station and awaits the arrival of the electric locomotives that will pull it through to Wellington on the west side of the pass. The steam locomotive will "drift" through the tunnel, which means steam will be applied to the pistons in just enough volume to prevent cold air from being admitted. "Drifting" will prevent significant quantities of locomotive exhaust from filling the tunnel.